The Mauritanian Mineral Train is one of the most epic train rides one can take. This humongous set of train cars – in fact, the longest in the world – can sometimes measure up to 2.5 kilometres and the railway it rolls on is made of a single line of 704 kilometres. Apart from its size, what is special about it is that the owners, the state agency Société Nationale Industrielle et Minière (National Mining and Industrial Company, or SNIM) allows people to jump on the train and use it as a mean of transportation. The train goes from the mine deep inland of Mauritania in Zouerate and carries iron ore to the port of Nouadhibou and then back. Most people ride it until Choum. It is the experience of a lifetime, blasting through the Sahara without a roof over your head, rocked by the sheer power of the locomotive and spending the night under the starry, pristine sky of the desert. Curious about how to ride it? The SNIM lets people board the train and use it as transportation, but do not expect any infrastructure around it. There will be no ticket, no food car or conductor to tell you where you are. It is also not bound to a timetable and might leave earlier or later than the usual departure time. It is thus very important to have a local contact who will be able to organize your trip and get the latest updates about the departure. Likewise, the arrival time is not set in stone and the trip can take anywhere from 9 to 15 hours. The train also makes a few stops on the way, but nobody will call them and the length of time the train will be stopped varies from time to time. For this reason, we highly discourage you from leaving the train at the stops. The train starts very abruptly and you could easily be stranded in the middle of nowhere. The most important thing to remember is to bring an offline map app (such as maps.me) so you can keep track of your location. Have an offline map because mobile connection in Mauritania is notoriously bad. 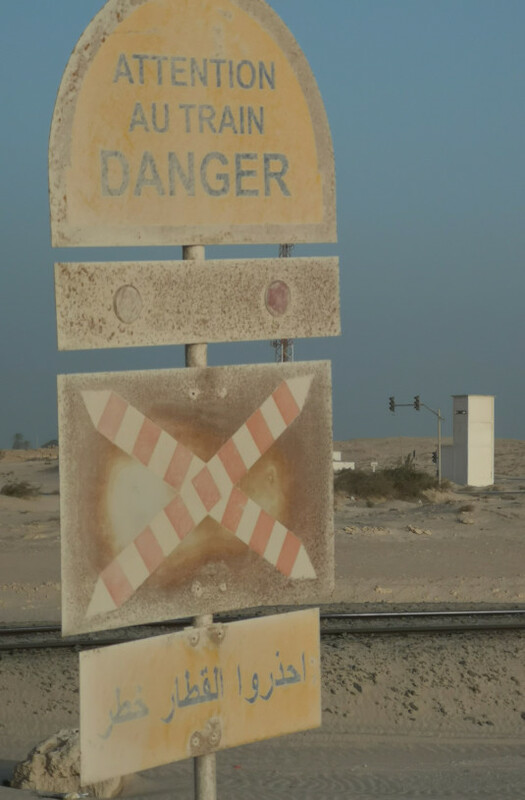 If travelling inland, you wouldn’t want to stay on the train past Choum and end up in Polisario-controlled Western Sahara, illegally leaving Mauritania. The train can be taken in both directions. You can either drive up to Choum and take it on its way from the mine to the coast, at Nouadhibou, or the other way around. 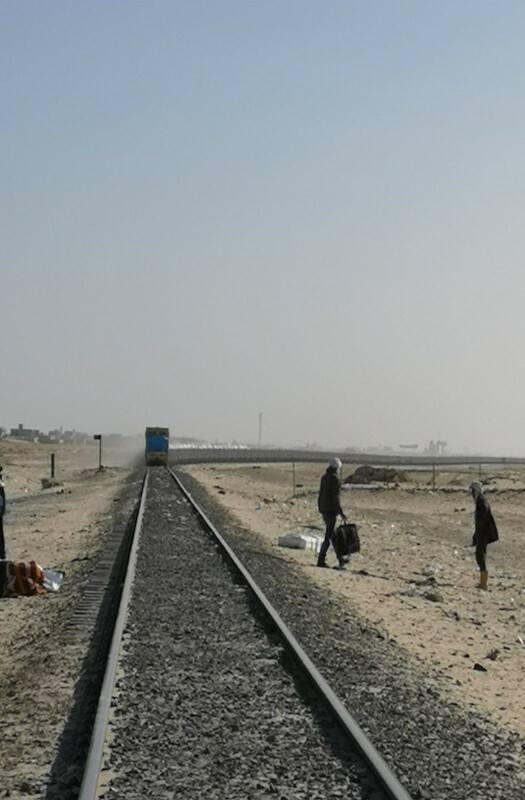 The train usually leaves Choum around 6 pm and Nouadhibou around 4 pm. Taking it on its way from the mine to the coast means that there will be iron ore on the cars; taking it the other means that the car will be empty. At YPT, we prefer taking it empty as it offers the best of both worlds. When the car is empty, you can still see the view outside by using the ladders to prop yourself up. 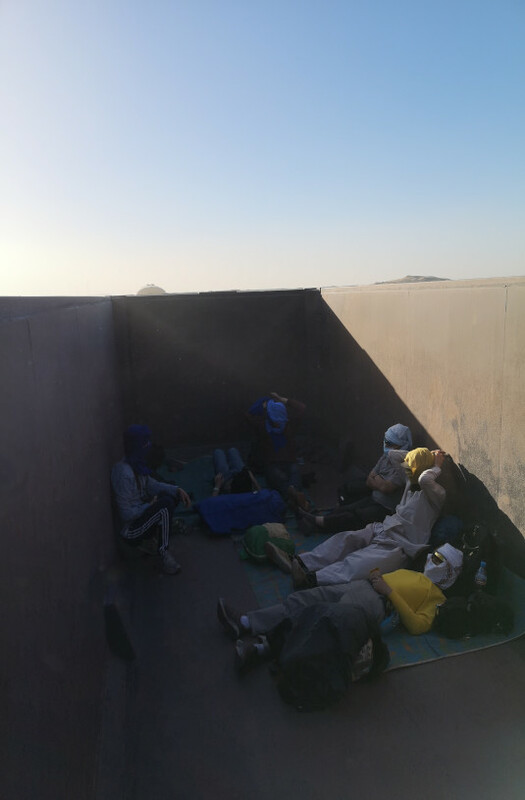 However, when you are tired of looking out, you can go down the ladder under the shelter of the walls to either stay under the shade when it is too hot or block some of the wind and sand. It is also much safer as you are not walking on a soft and uneven surface, but walking on flat metal. You can also place your things flat on the ground and organize the whole car to your liking. If you wanted, you could even pitch a tent in there. If you are in a group, it is definitely safer to travel in an empty car, as you will all be able to move without having to crawl. In an empty car, 10 people can easily fit and have plenty of room. This may not be everyone. We get it: for some strange people, the idea of spending a night in an open mineral ore train car is either not that interesting, or may even be scary. Know that there is one passenger car attached to the end of the train and that it is possible to do the ride from there. However, in our opinion, this is much less enjoyable and even maybe less comfortable than the empty train car. The passenger car is a car with cabins each containing 6 bunks. Again, this car is just put there by the company to reduce the amount of people in the open cars; nobody actually maintains it. It is extremely dirty, old and crowded with people as the bed and spaces are first come, first serve. For this reason we felt like the open cars, where you can have a whole car to yourself and a guaranteed view of the desert, with sunset and a moonset (yep, it exists and it is incredible here in the Sahara) is the best choice. One advantage of the passenger car is that it has a washroom, but it is truly nasty. If you are in the passenger car, you won’t sleep much because the ride is still extremely bumpy, warm and noisy. In the open-air car, you’ll experience what we tenderly nicknamed the ‘’sonic booms’’. The sonic booms are the tremors and loud noises caused when the cars hit each other. You can expect your whole body to shake and a very loud noise to be caused, at any time. It gets the adrenaline pumping and is definitely a large part of the experience. Because you won’t sleep much, you should have accommodation prepared upon arrival. 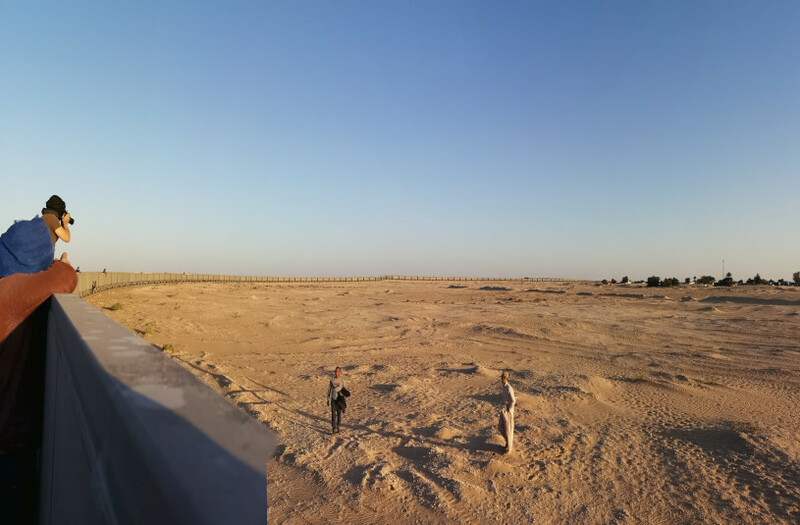 If you take the train to Nouadhibou, it is not so bad as you will arrive in town in the morning. Heading to Choum, however, will see you getting in at around 3 am. If nobody is picking you up there, you might find the night quite long. You might think that the desert is always hot, but the truth is that when the sun goes down, the temperature sinks dramatically. And in the wind-chill factor and it gets freezing past midnight. It is therefore essential to bring very warm clothes and blankets with you. Another advantage of the empty car is that you will be able to move around to warm yourself up. You could even bring a thermos of hot drinks for the night or some coal to brew Saharan tea on the spot. Since you’ll have to haul your stuff on the car, you don’t want to have big luggage. You can always arrange transportation for your bulky things by car and travel only with a bag containing what you need. Make sure to bring some food, such as fruits and sandwiches. You don’t want to eat too much, as it is not too convenient to make toilet whilst onboard, but you’ll definitely be hungry after a few hours. Bring plenty of water; if you run out, you’re out until arrival. Blankets are a good idea, as mentioned and maybe a mat to make the floor a bit softer. The ride is long, so you can think about bringing books, cards and games. A good idea would be to bring chalk to draw on the car’s walls and fool around. Bring a fully charged power bank to make sure your phone doesn’t run out of power. The train gets extremely dusty, especially if you ride it when it’s loaded up, as it is basically carrying iron dust. You might want to bring trash bags to wrap your bags in so that they don’t get too dusty. You could also wear old clothes you don’t mind throwing away. To protect your eyes, nose and mouth from the dust, do like the locals do: wrap a scarf around your head and wear sunglasses. 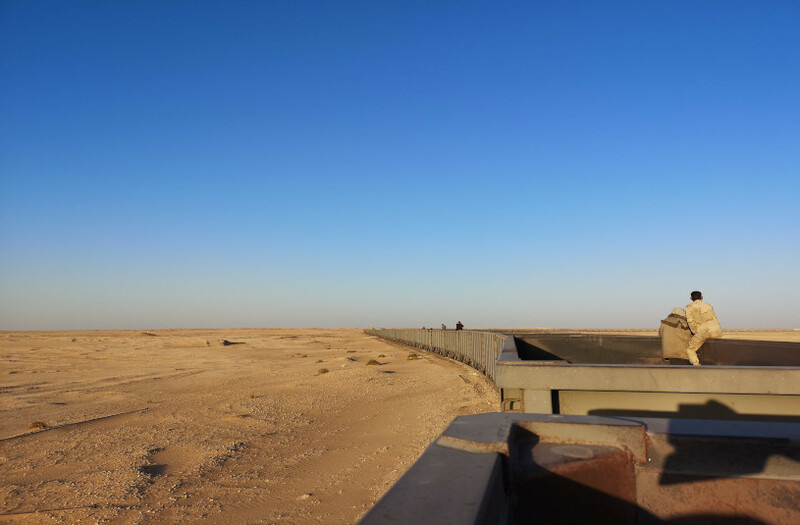 With these few tips in mind, we are sure that you will have the experience of a lifetime riding the mineral train of Mauritania. The scenery is incredible, the adventure will get your blood pumping and, if travelling with friends, good times are bound to happen! The easiest way to experience the mineral train, however, is surely to join us on our next Saharan Odyssey tour!